This porcelain regimental stein is decorated with a detailed Supply Train transfer decoration. The colorful motif wraps around the center of the piece and is framed on the top and bottom with raised-relief pearl borders, gold banding and a green leaf design. A detailed, domed pewter lid finishes the piece and is topped with a supply train figurine. The thumb lift on the lid is in the shape of a crowned eagle. 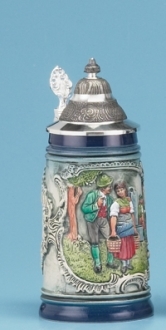 On the base of the stein there is a lithophane (translucent image) of a uniformed man presenting flowers to a woman. Stein stands 12-1/2" tall, including lid figurine. .50L capacity.